(i) The firm broke even at output 60kg. (ii) The firm made the highest profit at output level 85kg. (iii) The firm attained equilibrium at output 35kg. The firm operates on a project market structure. State owned enterprises are public companies established by the act of parliament and control by the board of directors in order to produce essential services for the citizens. Some state owned enterprises are owned by the state government e.g OSBC while others are owned by the federal government e.g NPA, NRC etc. (i) Huge capital outlay: Public corporations exist because of the huge capital involved. (ii) Welfarism: Government set up state owned enterprises in order to enhance the well being of the citizens. (iii) Equitable distribution of wealth public corporations are established in order to ensure even distribution of resources. (i) Inefficient management: poor management affect the effectiveness of public corporation. (ii) Corruption: political interference in the management of state owned enterprises promote corruption in the system. (iii) Lack of willingness on the part of staff of public corporations affect the efficiency of the enterprises. Commodity money is money whose value comes from a commodity of which it is made. The demand schedule, in economics, is a table of the quantity demanded of a good at different price levels. Given the price level, it is easy to determine the expected quantity demanded. Tax is a compulsory contribution to state revenue, levied by the government on workers' income and business profits, or added to the cost of some goods, services, and transactions. progressive tax is a tax in which the tax rate increases as the taxable amount increases. proportional tax is a tax imposed so that the tax rate is fixed, with no change as the taxable base amount increases or decreases. regressive tax is a tax imposed in such a manner that the tax rate decreases as the amount subject to taxation increases. Equality every person should pay to the Government according to his ability to pay, that is in proportion of the income or revenue he et jove onder the protection of the State. Is the sum, time and/manner of payment of a tax should not only be certain but the time and manner of its payment should also be convenient to the contributor. Economy: The Government has to spend money on collecting taxes levied by it- Since collection costs of taxes add nothing to the national product, they should be minimized as far as possible. 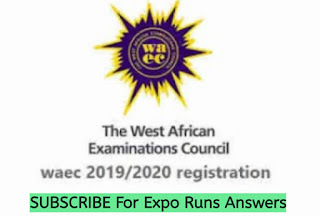 0 Response to "2018/2019 WAEC Economics Expo Answer Free (Obj & Theory/Essay) Questions and Answers - Jan/Feb Free Expo Answer"